22 Sept 2014. 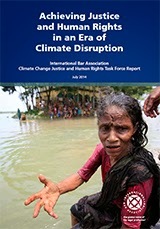 The International Bar Association published its ground-breaking 240-page report, Achieving Justice and Human Rights in an Era of Climate Disruption. The Report finds that, while climate change affects everyone, it disproportionately strikes those who have contributed to it the least and lack the resources to respond. The Report assesses the severe challenges currently facing national and international legal regimes which are poorly suited to provide legal remedies to those most affected, and outlines concrete recommendations for reform to create climate change justice structures that actively help protect and preserve environmental and human rights. Associate Professor Jolene Lin, Faculty of Law, University of Hong Kong, was a member of the Task Force chaired by David Estrin and Baroness Helena Kennedy QC. Jolene has also recently written an article, "Pangolins in Peril: What Conservation has to do with Global Security", published in the Georgetown Journal of International Affairs.